In 2001, UPS acquired Mail Boxes Etc and proceeded to rebrand the new subsidiary into the familiar storefronts we see today. In this episode of Mastering Innovation on SiriusXM Channel 132, Business Radio Powered by The Wharton School, Tim Davis, President of The UPS Store, elaborates on the strategies that guided the early stages of the acquisition, the role the stores play for startups around the country, and the challenges and opportunities particular to operating with a franchise model. The UPS Store, much like FedEx and USPS, is primarily known for one thing: shipping. 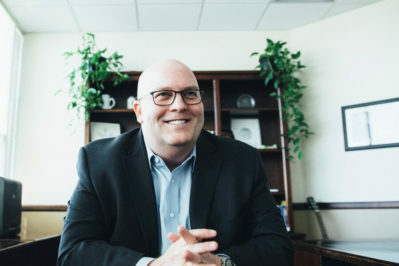 Since joining in 2002, Davis led the subsidiary’s re-branding efforts and emphasized its role as a support system for startups and small businesses. He discusses the strategies they use to target such businesses, offering printing and design services and even an auxiliary address a growing business can use as its own. Davis highlights the combination of self-serve and in-person offerings that drives their strategy in a rapidly changing retail landscape. Nicolaj Siggelkow: How tightly linked are the UPS Stores with UPS? Clearly there’s shipping going on, but what’s the link there? Tim Davis: You’ve got to think of it in a couple of different ways. First of all, there’s a world-renowned brand. We’re clearly associated with that UPS shield that everybody recognizes. It’s the largest transportation company in the world. But at the same time, we’re not just doing shipping. Shipping complements, at the small business and consumer level, other activities that we can do. We are a continuance of that brand, and it’s very powerful for us. But the thing that makes us a little bit different is that we are not just a department of UPS the corporation. We’re a wholly-owned subsidiary. We are unique in the UPS enterprise and family of companies in that we’re a franchise business. We’re headquartered in San Diego, while UPS’s corporate headquarters are in Atlanta. We run the franchise part of this retail business to extend the brand to all the customers that we come in contact with every day in the U.S. and Canada. Siggelkow: I have this organizational question right off, of how far to integrate the two, how far to have them separate, and so on. I’m intrigued about seeing how you help UPS the mother ship, and how does the mother ship help you and the information flow? Who learns what from whom? Davis: It flows both ways. Clearly, we are able to tap into an enormous amount of resources that UPS, the large Fortune 100 company, can provide, but we provide insights to them too. I’ll give you some of examples of how it complements and works both ways. I mentioned UPS’s marquee customers have an opportunity to use us. We have a concept called Corporate Retail Solutions where our function here works with UPS business development to try to find opportunities where we might be able to add value to the UPS relationship with one of their customers by presenting some of our services and tying them all together. For instance, we do a tremendous amount of set-top box returns for a cable company. People move. They’ve got to turn those things back in. And we provide smart transactions. We’re not just shipping a box back somewhere, but we are collecting data at the time of the transaction and we’re moving that data well ahead of the actual shipment, maybe changing locations or where these devices are going to go, depending upon the data we collect. This is a huge value to UPS’s customers, and it’s convenient for their customers’ customer. So that’s one way that we work to help benefit UPS. Of course, we get some advantages of their resources too. It does work very well together. Naturally, that shield on the marquee of our stores helps drive customer traffic. And it’s such a well-known brand that it really helps our franchisees develop relationships in their community. It works very well together. Siggelkow: I could very well imagine, given that you have such deep insight into the needs of the individual end customers, at least of a certain segment. That information must be of interest and importance to UPS for thinking about the shipping part and how to manage their operations effectively and efficiently. Davis: Absolutely. We have a lot of very practical and direct insight to those customers, those small and micro businesses, and general consumers that come into our stores. UPS is watching what we do and seeing what areas of our business are appealing to those customers. That’s valuable to them, so there’s clearly a good reason for that relationship to be working the way it is. Siggelkow: Retail of course, is currently undergoing lots of changes. Brick-and-mortar is changing wherever we look. What changes do you see happening with UPS Stores adjusting to these changes in the retail business in general? Davis: I’m glad you brought that up. I think there’s a big misconception that retail is floundering in the wake of e-commerce. One of the things that I really wanted to make sure we talked about today was that brick-and-mortar and e-commerce complement each other. Retail isn’t dying; it’s changing. These things are not mutually exclusive. Our concept is growing because we’re staying relevant, and we’re doing a number of things to remain relevant. For example, we’re in the midst of testing some new store concepts right now where we’re not just dealing with format and color, but we’re working on new formats, new fixtures, new workflows, to aid both the customers that come in with things beyond shipping. We’re adding a print design area, 24-hour access to a workstation environment, those kind of things. We’re also trying to improve workflow and technology for our franchisees and their associates as well. One of the interesting things I think that will help bridge the two worlds is a concept that we’re testing that we call Smart Lockers. You’ve seen package lockers around. Other transportation companies and even UPS have put some of those out, but we’re big believers that it’s the marriage between self-serve and human interaction that really is the sweet spot. Those concepts in our store, which we’re testing now, will work well in that people who want to self-serve while we’re there may have questions. They’ll have somebody they can rely on to help with other services that we provide. If they’re coming into our store in the day, they walk in. They have the advantage of picking something up at one of those lockers and then doing all the other activity that they could do there. But clearly, it’s not economical to staff those places at midnight, and there’s probably not a lot of foot traffic that’s going to come in there and want all those services after hours. With a code that we could pass on to the customers that could get them access to a secure area of the store, we’re still able to appeal to that segment. That is an economical way of serving them. So, labor and rent being the two highest costs of small businesses in a retail footprint, you want to find economical ways to provide services. It’s such an on-demand economy now that we’re trying to find ways to be both. Siggelkow: That’s interesting, to think about this mix of how we can provide all of these services as people want to do more from home and not have to go to a store to do things. How much can you do digitally, versus other things that still have to have happen? There’s still physical boxes that need to get moved. Davis: Well, yeah. They’re not teleporting things around. It’s going to be the George Jetson economy for a while. Davis: Humans are still going to be important. I’m a big believer that as appealing as all the digital commerce is, at the end of the day, people still want to do business with other people. And you’re right in that if people still have to get out and do stuff, we’ll put locations in other stores. A store-in-store concept is big for us right now. If you’re already out at a pharmacy or a neighborhood hardware store, we want to put a location in there. And we’re finding that to be very appealing both to those hosts and to the customers alike. At the end of the day people want to do business with people they know and trust. I think that’s not going to change. I think the reason e-commerce has really blown up and done so well is that those companies have found a way to eliminate the one thing that prohibited e-commerce growth before. They figured out how to take a lot of uncertainty out of the equation. Nobody thought that they were going to rush to buy shoes online, right? The uncertainty was, I’ve bought something and now I’m stuck with it, and I’ve wasted my time and money. They’ve done such a good job of taking that uncertainty and risk out of the way by making it easy to return items. That’s where our stores come in too. You’ve still got to physically move the items back. If you can do it in an easy, convenient way with all of the locations, and if you can submit the data for the host company that they need to improve their logistics and transportation lags, then I think you’ve got a real sweet spot. That’s the area that we’re trying to stay relevant in as well, and it’s a nice play for us.